Watch the short film above to learn what life was like in Hershey in 1915. The 10-minute 30-second film includes panoramic footage of downtown Hershey, scenes of Hersheypark and the chocolate-making process, as well as footage of Hershey Industrial School students. The rapid development of the chocolate-making industry in the late 19th century did not escape the keen confectioner’s eye of Milton Hershey. Building on the success of his Lancaster Caramel Company, Hershey began producing sweet chocolate and cocoa for flavoring and coating his own caramels in 1894. With the sale of his Lancaster Caramel Company to the American Caramel Company in August 1900 for $1,000,000, Hershey now had the money to expand his chocolate business. After exploring several sites in and around Lancaster, Hershey decided to construct his new factory in a new location. After considering several urban sites along the eastern seaboard, Milton Hershey rejected traditional urban locations for his chocolate factory and instead decided to place his business in the country. He chose a site in Derry Township, near the place of his birth where he already owned property and could purchase additional property at reasonable prices. The area offered plenty of fresh milk, dependable labor force, and access to urban regional retail transportation centers. Milton Hershey picked rural Derry Township against the advice of friends and business associates. They saw isolation. He saw a ready supply of fresh milk for his chocolate and a steady labor force made up of hardworking Pennsylvania Germans. His advisors saw the tiny town of Derry Church. Mr. Hershey envisioned a complete, new community. The town quickly emerged, following a plan that had been carefully thought out by Mr. Hershey. Workmen started digging the foundation for the Hershey chocolate factory in early 1903. Before the year was half over, a school and several other key buildings were also underway. In designing his community, Mr. Hershey was influenced by other “manufacturing communities” which were springing up at the turn of the century, both in this country and abroad. Like other “model towns” Hershey provided its residents with a wholesome environment, modern educational facilities, and affordable housing. 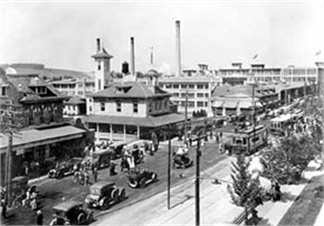 What set Hershey apart from similar towns, however, was that Mr. Hershey promoted it as a destination for tourists. The first factory buildings were one story high and covered six acres. The original factory was designed and built to manufacture chocolate in the most efficient way possible. Raw materials, cocoa beans, milk, sugar, were delivered at one end of the factory and processed, emerging at the other end as finished products ready to be transported to market. The key to the success of Hershey’s chocolate was the mass production of a few high quality items, including Hershey’s milk chocolate and Hershey’s breakfast cocoa in 1905; Hershey’s Kisses chocolates in 1907; and Hershey’s milk chocolate bar with almonds in 1908. Between 1910 and 1925, the ever-growing demand of consumers saw the factory increase its floor space from 18 acres in 1911 to 35 acres by 1915. When Milton Hershey chose a rural site for his chocolate factory, he also envisioned building a completely new community. When the factory began to produce chocolate in June 1905, many buildings and public works considered to be essential by Milton Hershey were already in place. The most prominent of these buildings was the Cocoa House (which housed a bank, post office, general store, and several boarding rooms) as well as a consolidated public school called the McKinley School. Rail and trolley lines, laid out to transport workers and raw materials to the factory, also connected Hershey with other towns. While ground was being broken for the new factory, newspapers and trade magazines published articles outlining Mr. Hershey’s plans for his new factory and town. Hershey encouraged the curiosity and interest in his plans, knowing the benefits of effective publicity. Milton Hershey capitalized on the public’s interest in his town from its inception. He included postcards of the town of Hershey in his nickel chocolate bars from 1909 until 1918. In 1915, Hershey opened a visitor’s bureau and began to offer chocolate factory tours. By 1935, more than 50,000 people a year toured the factory. In 1916, the Hershey Zoo, the largest free private zoo in America at the time, opened to the public. During the Great Depression of the 1930s, Milton Hershey took advantage of a ready and able supply of labor and cheap raw materials to embark on upon a massive building and public works projects to benefit his community and its growing number of visitors. Because of his vision, Milton Hershey constructed numerous facilities designed to meet a wide range of recreational, cultural, and educational needs which still benefit the community today. These buildings included: The Hershey Community Building, completed in 1932; the Hotel Hershey, completed in 1933; the Junior Senior High School (now Catherine Hall) of the Hershey Industrial School (now Milton Hershey School), completed in 1934; the Windowless Office Building of the Hershey Chocolate Company (now the Hershey Company), completed in 1935; the Hershey Sports Arena, completed in 1936, and the Hershey Stadium, completed in 1939. Along with resources like Hershey Park, founded in 1907, Hershey Museum, founded in 1933, and Hershey Rose Garden, founded in 1936, Hershey emerged as a nationally known tourist destination by the end of the decade. Though Milton Hershey passed away on October 13, 1945, the town and chocolate company as well as the various industries and philanthropies which bear his name continue to keep his dream and vision alive. In addition to a variety of resorts and recreational activities, visitors to Hershey can also visit Hershey’s Chocolate World, the visitor center for the Hershey Company; the Hershey Story Museum, where the story of Hershey comes alive, and Founders Hall on the campus of the Milton Hershey School, where visitors can learn more about the school founded to help children in financial need.